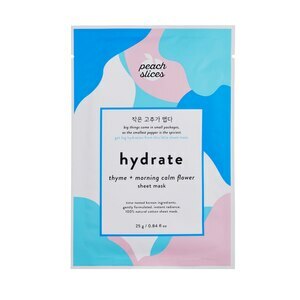 Natural cotton sheet masks soaked in an innovative blend of luxe and time-tested ingredients that provide instant results. This mask helps you achieve completely quenched and refreshed skin that looks and feels like you just walked out of a spa. Luxurious ingredients including thyme, morning calm flower, geranium, rose, citrus, wild mint and saffron work together to intensively moisturize, refresh and rejuvenate skin, instantly. What we kept out of the masks for you: No artificial fragrance, alcohol, parabens, mineral oil, dyes or coloring, formaldehyde, sulfates, animal testing. Water, Glycerin, 1, 2-Hexanediol, Butylene Glycol, Mentha Arvensis Extract, Rose Extract, Citrus Limon (Lemon) Fruit Extract, Crocus Sativus Flower Extract, Thymus Vulgaris (Thyme) Extract, Campsis Grandiflora Flower Extract, Geranium Maculatum Extract, Citrus Aurantium Bergamia (Bergamot) Fruit Oil, Pelargonium Graveolens Flower Oil, Salvia Officinalis (Sage) Oil, Pogostemon Cablin Oil, Panthenol, Betaine, Allantoin, Dipotassium Glycyrrhizate, Trehalose, Arginine, Polysorbate 20, Xanthan Gum, Acrylates/C10-30 Alkyl Acrylate Crosspolymer, Ethylhexylglycerin, Disodium EDTA. Cleanse: Cleanse face and apply toner. Apply: Remove and gently unfold the mask, place and smooth mask onto face. Chill: Leave on for 20 minutes and relax. Toss: Remove and discard mask. Glow: Pat in remaining essence. External use only. Use immediately after opening. Avoid contact with eyes. Keep out of reach of children. Store in cool and dry place.